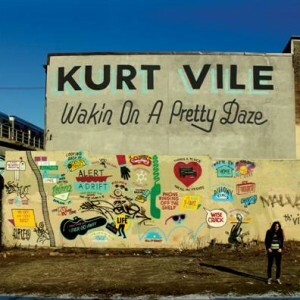 Kurt Vile’s Wakin on a Pretty Daze would be the soundtrack to a movie about someone’s languid, lonely life. It feels like an ode to the spacious corner of our minds, the one that contains mumbled fantasies and quiet dreams. This album encompasses a sprawling, unhurried sound that draws you into Kurt’s mind. The album is bookended by two outstanding tracks, Wakin on a Pretty Day and Goldtones. Both reach around the ten-minute mark, streams of music that appear effortless. While it is well known that Kurt Vile is a perfectionist, you would be forgiven for thinking that he just picked up a guitar and the songs merely poured forth from his talented fingers. There is no real appearance of a structure on the album, as the tracks unfurl in a slow and sleepy way. Brilliant album opener, Waking on a Pretty Day slides forward with harmonious layering and simple yet beautiful strumming. The beat change half way into the song is seamless and lends a delicate urgency to waking up on Kurt’s pretty day. Pure Pain starts out sharp and edgy only to dissolve into a gentle finger picking acoustic dream, and KV Crimes is surely Springsteen-inspired with its rocking cowbell and jarring electric guitar.Kurt is a subtle master of the music he’s creating. In Too Hard, a whining spacious guitar underpins his meticulous finger picking as he delicately muses over being a husband and a father. Snowflakes are Dancing is the closest the album gets to a short three-minute, radio friendly track. It’s a fast paced and lush tune that shimmers and swoops like its title suggests. The album can be listened to in its entirety, though at 70 minutes long, it can become something of a strain to get through. The album wasn’t necessarily created for active listening – it’s a glorious memory in your subconscious to be basked in as it struggles to the surface of your consciousness. Fooling us with the sarcastic line, ‘making music is easy/watch me!’ ,you’d almost think it was. However, Wakin on a Pretty Daze displays Kurt’s musical genius, even while it rambles and meanders along. Not be underestimated, this is a blissful piece of work that with each listen gently reveals another reason marvel at its beauty. This entry was posted in Music and tagged album review, kurt vile, music. Bookmark the permalink.